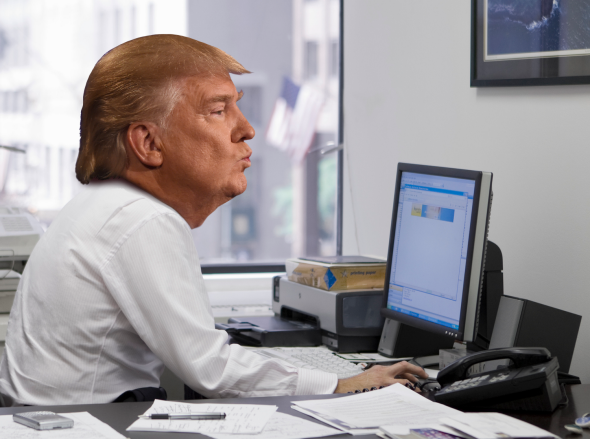 Trump knows terrifyingly little about computers. What is this magic box before me? Photo illustration by Natalie Matthews-Ramo. Photos by DigitalVision and Timothy A. Clary/AFP/Getty Images. Midway through Monday night’s presidential debate, moderator Lester Holt introduced the topic of cybersecurity into the conversation, asking the candidates to discuss who was behind recent hacks—and how the U.S. should respond. The question could have been a tricky one for Hillary Clinton, who’s come under fire for her use of a private email server. Instead, it became a minefield for Donald Trump—who may have never used a computer. Indeed, it revealed he knows so little about cybersecurity that the only expert he can apparently name is his 10-year-old son. In responding to Holt’s question, Clinton spoke in broad but coherent terms, discussing the danger of state-sponsored cyberattacks and scolding Trump for “invit[ing] Putin to hack into Americans.” She likewise offered an ambiguous, threatening remark about the status of American cyberweapons, observing, “And we’re going to have to make it clear that we don’t want to use the kinds of tools that we have.” This isn’t exactly technical stuff, but it still suggests that she understands the terrain—or, at least, the stakes of the conversation—which can’t be said for her opponent. The core assertion in Trump’s remarks here isn’t entirely unreasonable. In addressing the difficulty of identifying who hacked the DNC, he may be implicitly referring to what experts in the field describe as the “attribution problem.” Instead of working through the complexities of these issues, however, Trump seems to be proposing that when things are this hard to resolve, we shouldn’t bother. That Trump acknowledges such challenges is arguably admirable, whether or not it’s intentional, but here he puts that recognition into the service of a defense of Russia—a project that disquietingly aligns with his record on U.S.–Russia relations—seemingly using it to absolve Vladimir Putin’s government of any responsibility. As it happens, though, there’s plenty of evidence that Russia actually is responsible for the DNC hack, but Trump ignores that possibility. He is instead content to lazily body-shame the computer experts he’s clearly not listening to instead, shifting from a real challenge to stereotypical nonsense and offering a South Park–ready image of hackers as morbidly obese shut-ins. None of which, of course, has anything to do with the actual state of cyberwarfare. So we have to get very, very tough on cyber and cyberwarfare. It is—it is a huge problem. I have a son. He’s 10 years old. He has computers. He is so good with these computers, it’s unbelievable. The security aspect of cyber is very, very tough. And maybe it’s hardly doable. As is so often the case, it’s hard to untangle what Trump is actually getting at here. Like a cat batting at house flies, he swings at whatever catches his eye instead of focusing on a single topic. On the one hand, he suggests that cybersecurity is tricky—and it is! But on the other, he wants to reassure us that Barron, his preteen son, is really good with computers. What, exactly, is Trump getting at here? Is he trying to tell us that his son could solve these “hardly doable” problems, if only he had the chance? Is he proposing that these issues are so irresolvable that even a 10-year-old can’t work them out? Or, most likely, is he just saying the first thing that popped into his head? Regardless, it’s clear enough that Trump has no idea what he’s talking about. Better that he take advice from his son than, say, John McAfee, but Trump’s failure to come up with a coherent statement on the topic is telling, suggesting that he isn’t really listening to anyone. And, more troublingly, he doesn’t seem as if he cares to learn more. Concluding his remarks on the topic, Trump asserted, “We have so many things that we have to do better, Lester, and certainly cyber is one of them.” You can do better too, Donald. Start by figuring out what you’re talking about.